With yesterday’s arrival of Marco Cesa, Adriano Carbone and Paul Snoeij, our ESA team is growing. 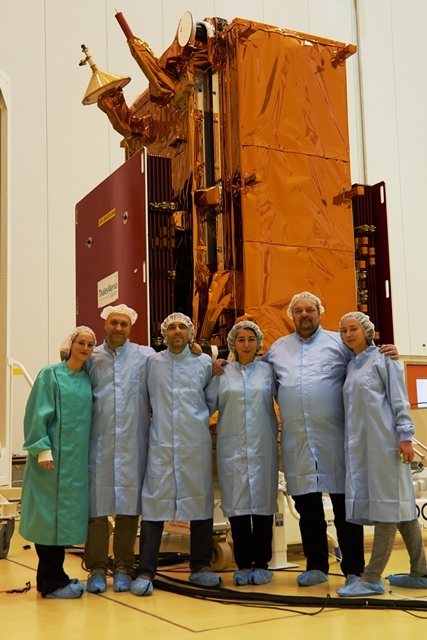 They managed a really good look at the Sentinel-1A satellite in the cleanroom, which was nice. Thales Alenia Space has finished setting up the electrical ground support equipment in the High Bay. This cleanroom is actually several kilometres away from the launch pad. There is a room called Catacomb very close to the launch pad and Thales Alenia Space has also started setting up the electrical ground support equipment there too. This allows the satellite and launcher to be closely monitored right up to the last stages of liftoff. 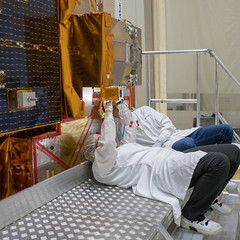 In addition,Sentinel-1A has been placed on the tilting platform, and Thales Alenia Space has started making the various connections for testing. Post from Svein Lokas (ESA’s Sentinel-1A Launch Campaign Manager), French Guiana, 27 February 2014.